The financially-flailing GAME has caused some consternation with the way in which it has decided to promote the new Android microconsole OUYA. Certain elements within the UK games enthusiast community have pointed to this being tantamount to encouragement to encouraging piracy of games, particularly through its billing of the SuperGnes emulator as an example of the “free games” available on the platform. That particular leap of logic requires a large number of assumptions, many of which can be demonstrated to be false in implicating GAME or OUYA as being complicit in the infringement of intellectual property. More concerning, however, is the possible chilling effect that this attitude being more widespread could have in terms of the preservation of video games as cultural artefacts going forward. At the core of the argument that seeks to vilify GAME here is the assertion that endorsement of an emulator is effectively endorsing all uses of that software: as the emulator can be used to make use of games ROMs obtained from non-official sources, it follows that GAME are endorsing the end-user’s potential to do so as morally upright and fine in the eyes of the merchant. The key auxiliary premise that is argued to support the above is that the association that many people make between emulation and unofficially-sourced ROMs mean that the two are virtually indivisible to the point that if one is promoting the emulator, one is promoting piracy. This is taken further by relation to the fact that the emulator is advertised under the banner of “free games”: given that the emulator itself is useless without some sort of SNES-compatible ROM image, it is argued that the “free” that GAME refers to her extends all of the way to obtaining images of commercial products. The key argument, centering around accusations of GAME’s being amoral in terms of stating that all uses of the emulator are free, fails to hold much empirical or philosophical weight. In the latter category, upon further examination, the claim becomes little more than an “is-ought” statement: it is being argued fairly transparently that, given that it is this case that emulators can be used for purposes that are not altogether legal, GAME is necessarily saying that our customers, having purchased an OUYA, ought to use it for such purpose. The patent absurdity of such an argument is not difficult to demonstrate: a parallel argument can be constructed fairly simply along the lines of “it is the case that pillows can be used to smother another human being, therefore merchants of pillows are necessarily saying that pillows ought to be used to take the lives of others.” In the pillow case, it is unlikely that the pillow merchant would be admonished for the advertising of his wares being instructive in a spate of bedroom suffocations. Of course, for those arguing against GAME’s actions, a way out does present itself here through the ancillary “association” premise: given the strong association between piracy and emulation, promotion of emulation is tacit promotion of piracy; a nudge and wink towards the likes of emuparadise by virtue of even deigning to mention the naughty word that is “emulation.” Even if this is true, it is difficult to see how it strengthens the charges made against GAME: while it is possible that they are hoping to profiteer somewhat from the association that potential purchasers will make, that does not change the virtue of their publicising a perfectly legal and moral technology. The association that people have is not something that has been created by GAME in an attempt to shift more of their products, it is an existing perception. If, to go back to our embattled pillow merchant, it were the case that a certain type of pillow – say those made from duck down – were more effective in the realms of smothering people, and this was widespread knowledge, would the merchant be lambasted for advertising his duck down pillows as duck down pillows? This would surely only be seen as accurate advertisement of what his product was. Empirically, there is no necessary connection between SNES emulation and the use of ROMs from questionable sources: there are many public domain and homebrew ROMs that could be considered “free” that a customer would be able to use without any legal or moral fallout. These games are “free”, make use of the emulator and are non-commercial: the “free-commercial-games” auxiliary premise falls on this, and the “association” auxiliary premise loses weight as well. The association that people have between emulation and piracy is accidental: one does not in any way necessitate the other. There is, in these arguments, the implicit association of people playing emulated commercial games with harm coming to their developers of publishers. In the case of Nintendo and SNES games, the line of reasoning her is that a lot of the games of the SNES era are being rereleased through the Virtual Console on the Wii and WiiU. 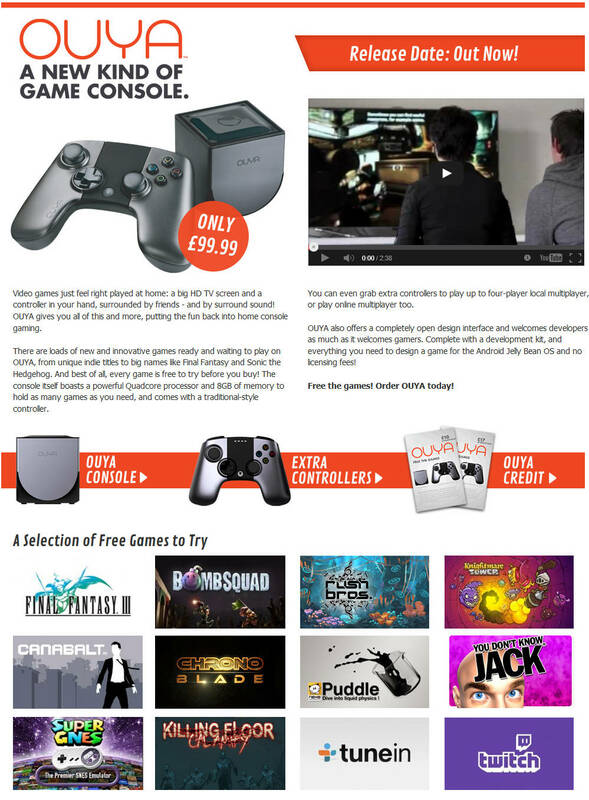 OUYA purchasers, sound in the knowledge that SuperGnes will play these games without the expense of the Virtual Console versions, will seek to, having been encouraged to do so by the advertising, play unofficially obtained versions on their OUYAs rather than paying for the newer versions. These arguments, however, miss the key virtue of the Virtual Console versions of the older games, particularly on the WiiU: these releases are not like-for-like with the original games. Changes have been made to make the best use of the newer hardware, such as the ability to be played on the WiiU gamepad rather than the TV: charging for these versions is far more excusable than expecting to be continuing to make money from a product more than fifteen years after it was first released. A particularity of the creative industries is very much the fact that people expect to continue to be remunerated for years after their have completed a work or finished a performance: this is something that simply does not happen anywhere else. A further peculiarity of video games lies in the dependence that the output product has on a particular piece of hardware, manufactured by only one manufacturer: I can play an LP on any turntable; a CD on any CD player; but I have to play NES games on a NES; Megadrive games on a Megadrive. Emulation provides us with an answer to the question of preservation of these cultural artefacts into perpetuity, enabling compatibility between old hardware and new hardware – enabling us to continue to appreciate games that have had impact upon us, and to explore the swathes of region-locked games that have defined every console generation until the current one. As games enthusiasts, we have to decide: do we care more about games as a business – in which case, we can continue to bemoan pirates for being oh-so-awful for opening up access far wider that it would otherwise be – or we can appreciate games as culture, and in so doing appreciate that we need, and therefore should encourage, any way in which we can preserve games into the future. As things are, emulation is the best route for this.